As it says on the tin. I have been drawing pretty much all the major constructions in Sacred Geometry on Adobe Illustrator for use in my own artwork and design. 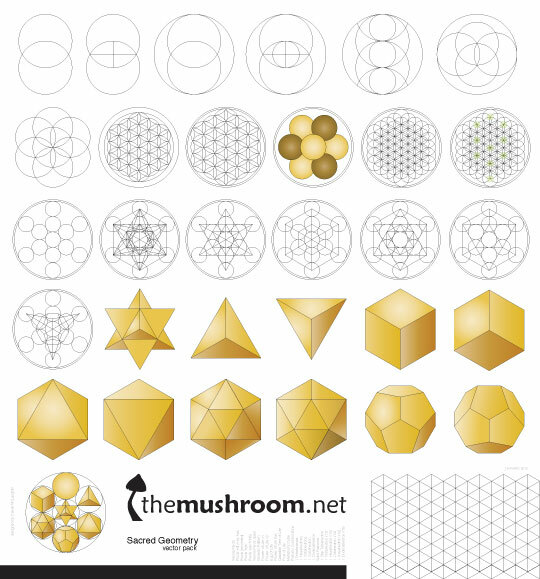 As a graphic designer it occurred to me that this gave me enough material to produce a Sacred Geometry vector pack where others could download all of these elements in one simple file. I have found various elements on the internet but never all together in one free vector pack (and never as nicely drawn obviously). Sacred Geometry is truly sacred (my humble opinion but shared by many others wiser than I) and as such this work should be free and as widely distributed as possible. Share it, change it, spread the word and use it as you see fit. My goal in doing this is nothing other than my offering and sharing of something good and beautiful to the world. It is universal and so it is all of ours, I was just the instrument of this particular expression of it. More people than ever are being switched on to Sacred Geometry. I hope that this adds fuel to the fire. To be clear these downloads are and always will be 100% totally free. However some people who have got value from the vector pack and have wished to offer their thanks for my work in a monetary manner. These occasional donations are a great kindness, and they mean the world to me. Should anyone wish to make a payment, entirely of their own volition, I have added the below PayPal button so you can do so. Beautiful work. Thank you for sharing your skill and interest. Enjoy the weekend and please visit our site. Thanks man. I appreciate the kind words. Enjoy! I’m not hoonboy any more, and a new project required the search term ‘free sacred geometry vectors’. Guess what was top of the list? Amazing! Miss you too man! But its only going to be half a year or so til I visit the UK again I reckon. Til then, make sure you use all that digital technology at your disposal to keep me posted. I’ve been looking for something like this for a long time dude. Awesome work. See you in the 5th. My pleasure… Glad u found what u were looking for. 😉 One Love. Hey this is great! Thanks for sharing. Love it. I’m not sure about your Star Tetrahedron though (the first yellow piece) .. . i think it has too many lines on one of the ‘triangle/pyramid’ pieces. If we’re looking from the top down, we see 3 sides of one, and 1 flat side of the other, right? therefore no additional lines. That’s how i’ve always drawn it.. . .. maybe i need to double check myself. Love the variations of Metatron’s Cube. Yes. I spotted that but had not got round to fixing it yet. I did all this very fast and managed only too spot the error in hindsight. I will get a corrected star tetrahedron up very soon. Hopefully today. Edit: Now fixed and re-uploaded the file with correct Star Tetrahedron’s. Sorry. I’m in the Australian outback at the moment travelling. I hope someone else van save the AI file for you. I would but i have limited internet on my phone only. Thanks so much for this – I have only just started working with sacred geometry – it is truly wonderful. Thanks to getting me off to such a good start. How wonderful!! I too have made many of vectors of sacred geometry but never quite satisfied with the results. This will be a great assistance in my artwork and designs. Thank you so much for being such a giving soul and sharing the sacred knowledge. Love&Light! gracias. estoy rediseñando la informacion de Merkabah y este archivo es de gran ayuda. Thank you so much. I am very glad you found it useful. I hope your work in turn is of value to others. One Love. Thank you for taking the time to comment. One Love. thank you very muchly. awesome. this is perfect for a uni architecture assignment i’m working on. and i like the way you’ve shown the solid geometry too, that helps understand it all a little better. peace. Thank you again for download and info. I really appreciate your sharing these files – thank you so much! 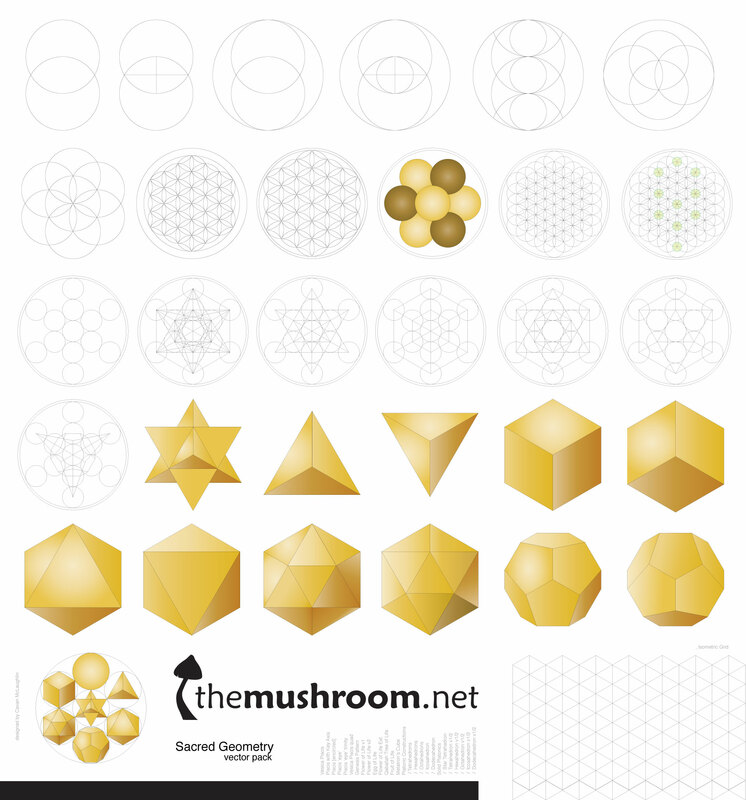 I’m going to make some flower of life sacred geometry with my laser cutter and combine it with orgonite! Thank you for this. It’s a very nice gift for the collective. Thank you. I hope it comes to good use. This is truly a gift to the enlightened. I will be adding this to a presentation of mine. hi, i’ve been searching for this a lot of times, I searched it as “geometria sagrada vector” but nothing would appear, then i thought in english of course, something will always come up. Again, thanks! Please excuse my ignorance. I sincerely wish English was not my only language. Thank you for your comments. Aloha! & Mahalo Nui Loa for sharing your beautiful work and all the time it took to create it! I came upon an idea for using sacred geometry for a glass etching project. I almost opened up my illustrator and started drawing, then thought, someone else has to have done this already. I didn’t expect to find such a comprehensive collection all in one place, on the first search i did and the first link i clicked. This would have been so many hours to do on my own!! I appreciate your kind gesture, it has helped me tremendously. I’ll be sure to spread the love.. You are an inspiring being! Much Love! And thank you so much for taking the time to comment. It means so much to me when people let me know how they are using the vectors in their work. Your comment brought a big smile and helped make my day. I’d love to see how the etchings turn out if you have time. One Love. Sorry Matt. I changed hosts yesterday and the migration has messed up the plugin that manages these downloads. I am fixing it as we speak. I will reply again when it is working fully. Should be very soon. The links have been fixed! Apologies for the short downtime. Thank you SO much! This is an unbelievably wonderful gift. I’m humbled by your generosity. You’ve done us all a great favor. Blessings be upon you! Thank you for your generosity. Its the abundance that comes from within and manfiests with amazing potential. I just started to re-work my website, after years of abandonment. I like the template and I want sacred geometry to be an essential part of it. I am so grateful. Man, this is just what I need! Thanks for taking the time to make this – it’s gonna help with my ongoing project. It’s also been cool to read some of these comments from the other users, so cheers for that aswell! Congratulations on your work and thank you for sharing. I would like to have the original file you mention if possible. THANK YOU for freely sharing this: what a beautiful spark! ___ please …i want to recev your pacage of draws. Thank you for these! Saved me much work! Sent a small donation! Hope others do too! Wow this is excellent, Thank you for sharing! AWESOME CONTRIBUTION!!! THANK YOU SO MUCH! Man, what a blessing. Thank you for your offerings and talents. You are Blessed. I’m interested in the original files too. Yes! Love to hear what my vectors are doing out in the world. I am SO grateful to have stumbled onto your free vector pack. Thank you more than I can say… it taught me SO much! I was about to create those patterns in Illustrator, could have taken huge time. But will be using ur gift of ‘ sacred geometry ‘ to the universe. May God bless you with Divine Power, Divine Love and Divine Light. Awesome divine work bro! How to download this, I can’t find any download or link anywhere here. Can someone help, please? Thank you so much for sharing this ! I am going to make a pattern using the dodecahedron and laser cut in on the wood panel ! Namaste friend. How refreshing to find exactly what I was looking for, given in such a loving way! Thank you so much for your vector… donated- it’s not much but wanted to say thank you and buy you a coffee for your kindness. 🙂 One Love!!! Ahí veo que escribiste los nombres, pero no sé cual es cual. ¿en qué orden van los nombres de las figuras? Thank you, nice things lay on your way!